For a weekend getaway, my wife Marilyn and I recently headed up the California coast to Eureka. 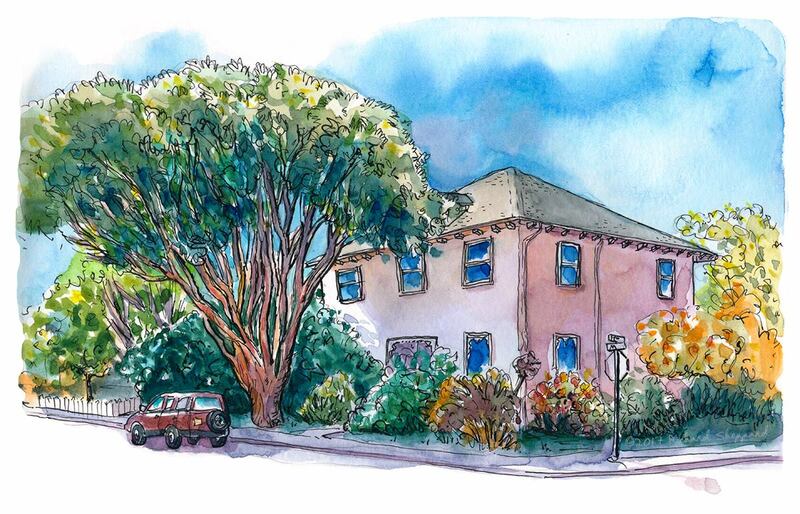 The city is situated on Humboldt Bay and is surrounded by abundant redwood forests which provided income for the early settlers of this 19th-century seaport town. The entire city is now a state historic landmark, known for its stylish Victorian homes, including the nationally recognized Carson Mansion, and the Old Town Historic District. 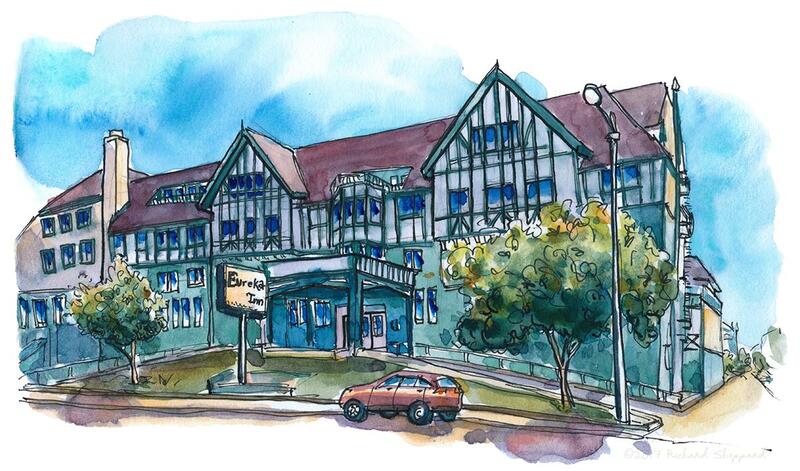 We stayed at the famous Eureka Inn that was built back in 1922. Over the years it's had numerous distinguished guests including: Herbert Hoover, Ronald Reagan, Gerald Ford, Bobby Kennedy, Lady Bird Johnson, John Barrymore, Shirley Temple, Laurel & Hardy, Bill Cosby, Carrie Fisher, Jeff Goldblum, Steven Spielberg, Ringo Starr, Robert Plant, and Joan Baez. 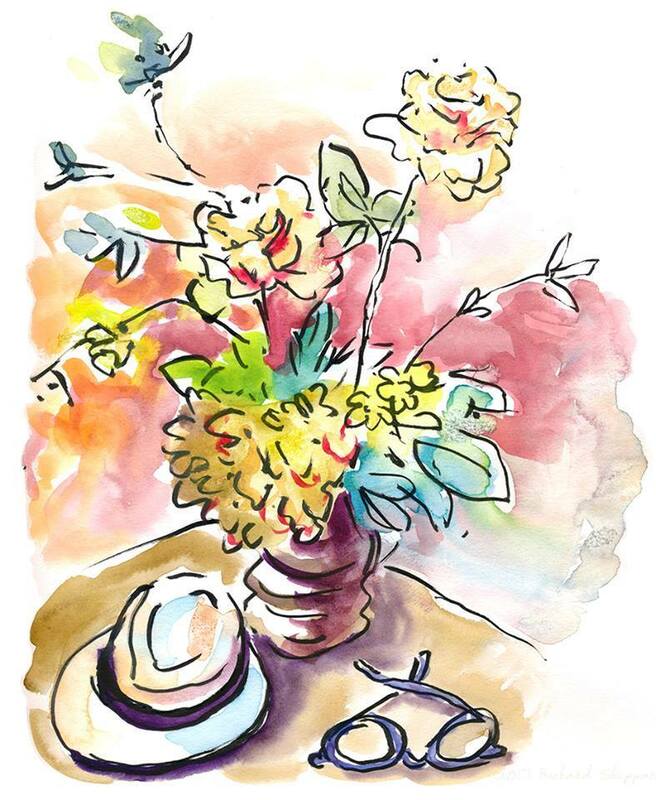 A quick sketch of my hat and glasses next to a flower arrangement in our hotel room. With an entire weekend ahead of us, I had plenty of time to relax and sketch local landmarks. 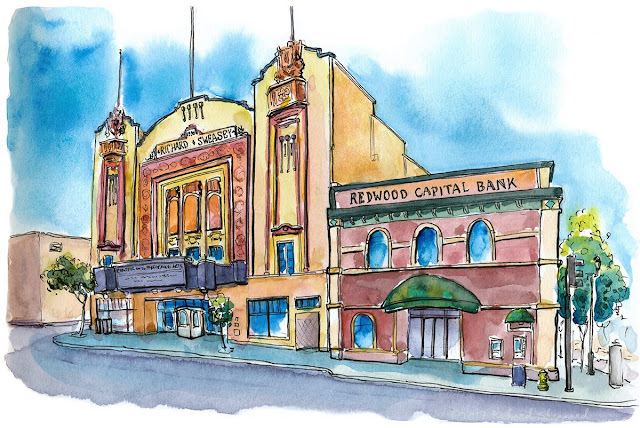 The Arkley Center for the Performing Arts, only a block away from our hotel, is home to the Eureka Symphony and also hosts traveling dance, comedy, and music groups. On Sunday, we went on the Heritage Society Home Tour to explore this city's stylish Victorian homes. Not a Victorian, I know, but I loved this tree so I sketched it. The afternoon was cold and windy so I sketched Pat's Market from the car while Marilyn read a book. In case you were wondering (of course you were!) 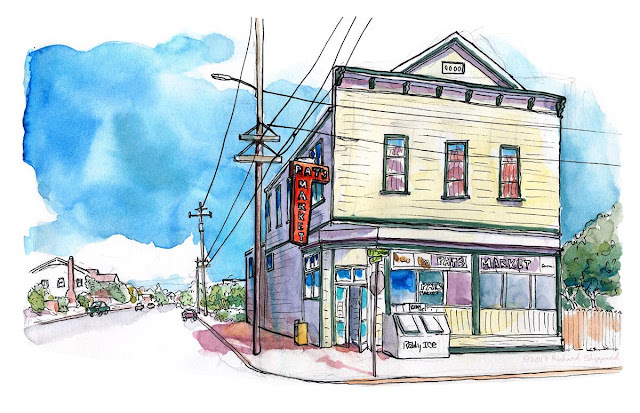 the town of "Eureka" is a Greek word meaning "I have found it!" It was aptly named by the gold rush miners when they struck it rich and said, "Eureka! Eureka!"